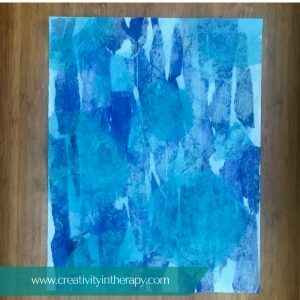 Tissue paper can be a great art medium to try in therapy. I find that it helps to encourage playing with colors and materials, experimenting with new techniques, and focusing on the process. For myself, I have always enjoyed that working with tissue paper forces me to be more abstract and less focused on achieving a certain outcome. 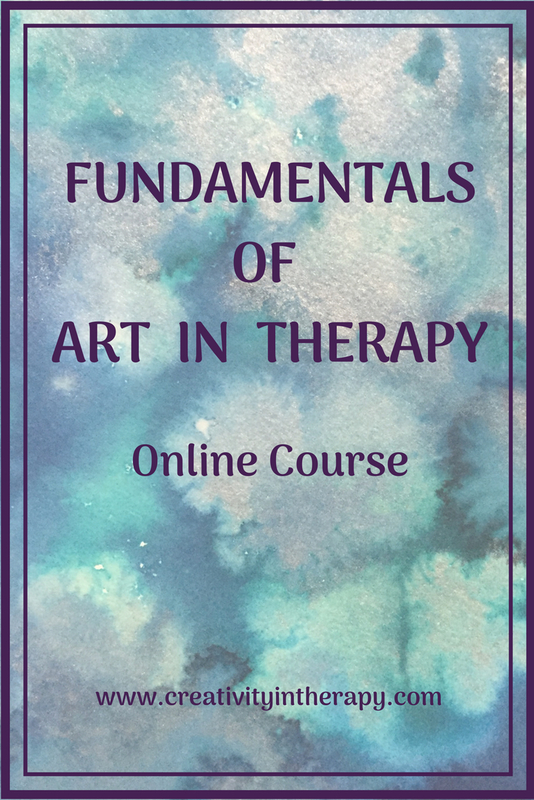 I have been using tissue paper in some of my groups lately and playing with it in my own art, so I thoughts I would share some ideas for using it in therapeutic art. *I like to use a liquid adhesive applied with a brush. You can use matte/gloss medium, white liquid glue like Elmer’s, or Modge Podge. When you’re done, you can finish the whole art piece with a final layer of medium (unless, of course, you have pieces sticking up that you want to remain soft and upright). Glue sticks will work to hold the tissue paper, but give you a different effect. Why Try Tissue Paper Art? Vibrant colors and layers – Tissue paper comes in so many rich, vibrant colors. As you layer the tissue paper, the other pieces will show through. This can create some really beautiful art and interesting effects. 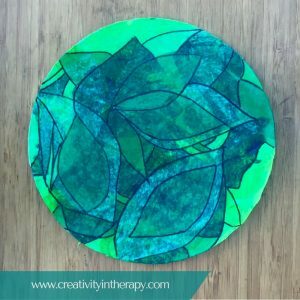 Encourages play – Many of us did tissue paper crafts as kids, but few people use it for art as adults, so making tissue paper art can help trigger those fun feelings from childhood. Play is so important, even as adults, and art can be a great opportunity to let yourself play. 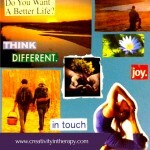 Creativity and experimentation – Since it’s an unusual medium, you get to experiment with something new. Creativity naturally is encouraged as you try to figure out the different ways to use the tissue paper. 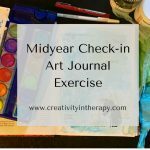 Using something new and different means you have to give up habitual ways of making art and open yourself to a new process. 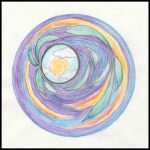 Focus on the process – The unpredictability of the medium encourages you to be more present in the process of creation and less focused on a preconceived outcome. 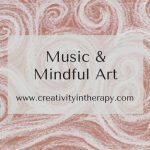 This is a great opportunity to practice mindfulness, listening to your creative intuition, and adapting as you go. Abstraction – For people who are naturally drawn to representational and symbolic art-making, tissue paper can be a good way to encourage abstraction in art. This can open up new means of self-expression and inner discovery. 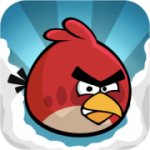 Giving up perfectionism – Tissue paper is hard to control! Even if you are cutting out the shapes you want, it’s a difficult process. 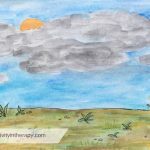 This allows you to practice letting go of expectations in your art and embracing all the interesting imperfections that arise. If you don’t already have tissue paper available with your art materials, I would encourage you to add it. Tissue paper can be used as part of many different art pieces and directives; clients may choose to add tissue paper to collages or sculptures that they are making. 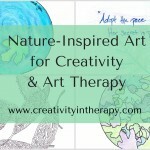 However, you can also provide some specific art therapy directives to encourage them to try tissue paper art-making. 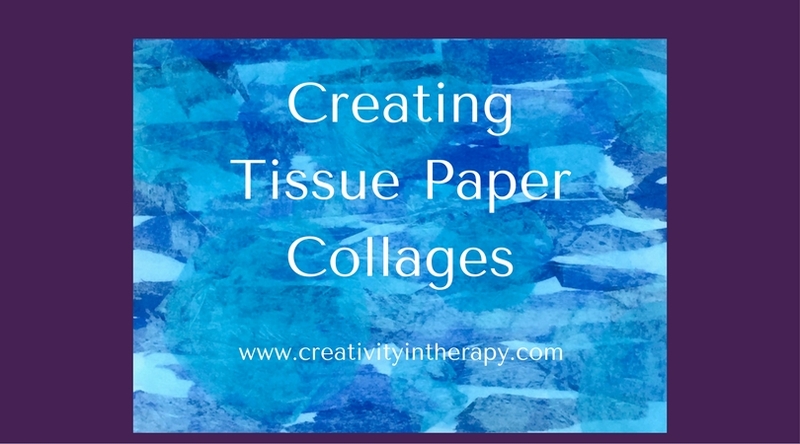 Make a torn tissue paper collage – This open-ended prompt may make some clients uncomfortable, but with others it will encourage interesting, process-oriented work. Tearing the paper and not using any scissors leads to problem solving, practicing acceptance of limitations, and discovering happy accidents. 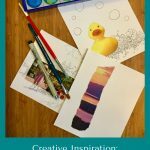 Make a picture about how you are feeling – Start with colors that represent your emotions today and create a collage that expresses how you are feeling. 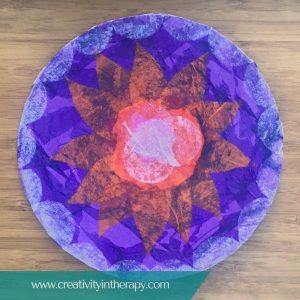 Tissue paper mandala – Start with a cut out circle and create a mandala with tissue paper. If you want repeating patterns/shapes, fold over the tissue paper several times to create multiple layers and then cut out the shape you want. Mixed media doodle or intuitive drawing – Start with overlapping shapes of cut or torn tissue paper on your paper. After the glue has dried, go back with paint, Sharpies, or oil pastels. If you want to doodle, just fill in different sections with lines and patterns. Or do an intuitive drawing by looking for an image and then embellishing to highlight it and create a finished artwork. 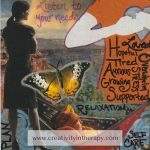 Do you use tissue paper in your own art or in therapy with clients? Please share your experience in the comments below. And link to your Instagram, Facebook, or website posts if you want to share some examples of your own tissue paper art. I’d love to see it!